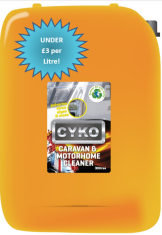 CYKO™ Caravan & Motorhome Cleaner gets to work instantly. In mere minutes your home form home will shine like it never left the showroom. Working deep down at a molecular level, breaking up grime and algae with unparalleled ease. 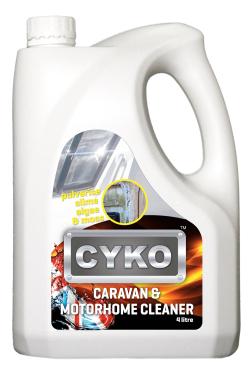 CYKO™ Caravan & Motorhome Cleaner works equally well on trailers and awnings. 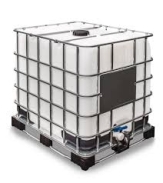 Is safe to use on EVERY part, from chrome to rubber, aluminium to leather, windows to bumper, top to toe! 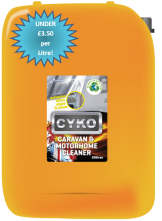 CYKO™ Caravan & Motorhome Cleaner is tough on grime and the causes of grime, yet gentle on the environment & completely biodegradable. CYKO™ products are not tested on animals because that would be cruel, and CYKO™ is anything but cruel. Besides whoever heard of a shiny rabbit? 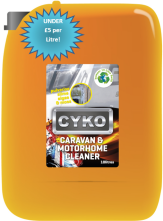 For best results, pre-wet your caravan / motorhome, apply CYKO™ Caravan & Motorhome Cleaner liberally and leave for 3 - 4 minutes. Tickle any particularly awkward grime with your favourite brush or sponge & then rinse off with fresh, clean water. Job done!